The presidential candidates almost killed my cats last night. Grievances and morality aside, it was a fair experiment in semantics and responsive electroshock suggested by several Desk members and carried out beneath the angry protests of my wife, who, despite being a woman of science, could not fathom its goals. But it is a presidential election year, and there will be causalities, and I could not be expected to sit through 90 minutes of the rich white Yalies yammering on about how they plan on carving up the planet and restructuring cultures under the guise of “protecting” the United States without some sort of interaction. It should be noted that I asked neighboring parents for human volunteers, but instead of allowing their children a chance to escape video games and pouting to be part of an educational endeavor many chose to call the cops. It was an obvious indictment on our community’s stunted evolution in thought that needs to be dissected in future columns, but, alas, this is a state that mocked Thomas Edison and then named towns and counties after him. The experiment, headed by noted scientist and close friend, Doctor Cunliffe Merriwether, author of the exciting new book, “Quitting Science”, was two-pronged. Firstly, any candidate merely using the exercise of debate to spew the usual campaign rhetoric would send a mild shock to the ears of each cat. Our female cat, Mazzy was hooked up to the Kerry Meter. The male cat, Gueem was attached to wires under the Bush Battery. Both were dialed into hardware carefully designed by the hard working kids at Fairleigh Dickinson University (the Teaneck campus). The second penalty was for an error in facts while advancing an argument. This was a lethal component and nearly led to divorce, but luckily, as you will see, stretching the truth and playing with numbers did not get the felines fully singed, only slightly so. In its most basic form the experiment, if not the debate, proved two things: The participants and their allies are hoping we don’t pay attention to detail, and my cats now cringe when shown a picture of either candidate. It should also be noted that these college kids consider themselves “dog people” and are not planning on voting, or voting for Ralph Nader, which many consider the same thing. I do not concur with this defeatist attitude, but then again I was torturing my pets merely to compile material for a column, so who knows? A third penalty was not agreed upon by my wife or even the hearty members of our experimental group, a searing shockwave if either candidate went over the allotted time designated by a 30-page Debate Commission rule book amazingly agreed upon by the Kerry attorneys, considering the bluster of their candidate. But, it turned out, having flashing green-yellow-red lights on the podium kept these crisp orators from blathering forth, and, I think, provided a nice Game Show kind of feel to the otherwise dry proceedings. The following are the results of the experiment and apparently clear evidence that if not for my wife constantly switching to the NY Yankees winning the American League East title throughout the broadcast, the life of my cats were in serious jeopardy. Gueem shuttered violently when the president, defending his half-assed military campaign in Afghanistan, claimed on three separate occasions that 10 million Afghanis had registered to vote. However, the Human Rights Watch this week proved that figure inaccurate because of the illegal multiple-voter registration and rabid human rights abuses fueled by a pervasive atmosphere of repression and fear throughout the country. Other half-truths and bold-faced lies included the George W. Bush’s insistence that there are 30 countries in the war coalition, when half a dozen have already bolted, and the disingenuous suggestion that Poland was involved during the invasion when they were only part of what has become the interminable clean-up, policing affair. Also, the president’s insistence that 100,000 Iraqis have been trained to fight on the coalition’s side is wishful at best. According to a widely recorded statement by Iraqi Prime Minister Allawi last week, only 50,000 Iraqi troops would be ready by the proposed January election. Kerry erroneously claimed weapons of mass destruction crossed the Iraqi border every day. Zap! Bush claimed 75% of al Qaeda was gutted, despite CIA reports in August that just 66% of the original members responsible for 9/11 were apprehended or killed while more than twice as many have joined forces since the Iraq occupation. Buzz! Finally, both candidates, expecting most Americans to have little to no idea what’s transpiring in North Korea or Russia threw facts to the wind in a drunken abuse of reality. Bush charged that Kerry’s proposal to have direct talks with North Korea would end the six-nation diplomacy that the administration has pursued over Pyongyang’s nuclear ambitions and cause China to withdraw. Zap! Truth is four of the countries have already held extensive talks with North Korea during the six-party process and China has publicly called for the U.S. to conduct open negotiations with the rogue state. Kerry lost his mind for a moment when he claimed to have visited a place he called Treblinka Square in Russia years ago when no place exists. Buzz! Treblinka was a Nazi death camp in Poland during WWII, not a salient geographical location to the present debate. But even I had to step in and end the madness when the Buzz Word/ Mission Statement part of the experiment got out of hand. 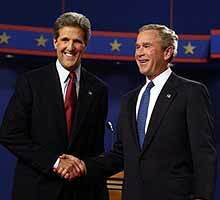 From the beginning both candidates used questions and issues to set up their repetitive campaign jargon like Bush’s mantra that his opponent sends a “mixed message”, a phrase he used no less than seven times, while Kerry drove home the words, “mislead or misjudge” some 11 times. Thanks goes to MSNBC’s David Shuster for providing these crucial final tallies. He also wanted me to point out that he made several calls to the ASPCA to report us. Just imagine yourself getting a little electric charge on the ear every time pre-programmed politicians use the same damn expression. When discussing his expensive and questionable strategies in this ever-popular War on Terror, Bush used the words Threat and/or Protect American people 16 times, Free or Freedom a whopping 35 times, Strong 12 times, Hard Work seven times, and Progress five times. John Kerry, driving home this fantasy that any country not already involved in this Iraq mess would be willing to follow his pitch, used the words Alliance 12 times, Plan 17 times, Change Direction seven times, and Safer five times. P.S. For those slow on the take, the above is satire. No cats, especially my spoiled felines, were harmed for this column. However, its liberal pushing of the deadline might piss off my copy editor, Terry. P.P.S. Unfortunately the bluster and lying by candidates is no joke.